Consider finding something that, just years prior, everyone was after but nobody found. At one point this item would have fetched four, possibly five figures but now, it's worth as much as its weight in cardboard. Man, a sad situation that would be. Sorry, kid; you're just a few years too late. On October 7, 2017, a member of the Collectors Universe forum1)Just pulled this. Just A few years too late. No redemption. forums.collectors.com that goes by the name of Beck6 pulled the once monolithically valuable end-all redemption card of all redemption cards (at least in 2010) - the Stephen Strasburg 2010 Bowman Chrome Rookie Autograph Superfractor. This card, if pulled during its prime, would have netted the owner thousands if it was acquired and sold. Only thing is, the redemption card expired on September 30, 2013. The owner inquired with Topps to investigate options and Topps replied that there was nothing they could do. Does that mean the redemption card itself isn't worth anything? Not at all. The owner has already had offers; one of which was $200. I personally would be happy to own it for that price for its significance alone. According to Topps, Stephen Strasburg signed three different 2010 Bowman Superfractors. Bowman Chrome has gotten pretty confusing over the years due to its multi-release format, which makes card identification somewhat of an unnecessary headache. Each card should state which set it comes from, much like how Upper Deck did when they wised up about product identification in the mid-2000s. At the time of this writing, Topps still hasn't caught on to adding this highly important information to each of its Bowman releases. With regard to Topps stating that Stephen Strasburg signed three different Bowman Superfractors, let's have a look a few different runs to narrow it down. 1. If three signed 2010 Bowman Chrome Superfractors exist, unless confirmed otherwise, the following three cards are those which can be found as Superfractors since they are Stephen Strasburg's only three signed cards from 2010 Bowman Chrome. However, and as we'll read in a moment, only one of these cards can be found as an autographed Superfractor. Left: 2010 Bowman Chrome #205B AU. Common and made available as a pack-issued direct release. The Superfractor of this card was graded BGS 8.5 on November 7, 2013. Middle: 2010 Bowman Chrome Draft #BDP1B AU. Uncommon and made available as a pack-issued redemption release. Right: 2010 Bowman Chrome Redemption AU. The image shown is actually just a mockup designed by Topps and used for product marketing. The actual card is believed to be the Superfractor version of card #205B. Since the redemption card for this wasn't pulled before expiration, sometime between September and November 2013, it's believed Topps sent it to a customer as a replacement, which is why there's a record of it being graded. 2. When the Topps rep. indicated that Stephen Strasburg signed three Bowman Superfractors, perhaps that includes not just Bowman Chrome, but Bowman Platinum as well. If that's the case, the following are the only cards from 2010 Bowman releases that can be found as autographed Superfractors. Note that only one of these cards is from Bowman Chrome, card #205B. 3. Just for good measure, the following are the only four Stephen Strasburg cards from 2010 that can be found as autographed Superfractors. Note that only one of these cards is from Bowman Chrome, card #205B. 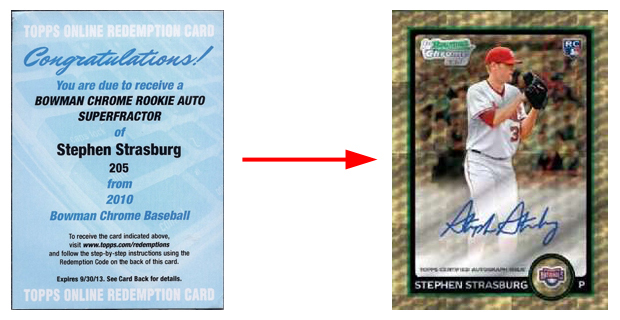 The only reason why Topps would release the Superfractor version of the Stephen Strasburg 2010 Bowman Chrome #205B AU is because the redemption expiration date had passed. Better to send it out to a customer than trash it so I can understand why it made its way into the market and was graded back in November 2013. The Strasburg Mania in the early summer months of 2010 made collectors ripe with excitement. Everyone was after his cards and anything that had his name on it was as liquid as any item could possibly get. The 2010 Bowman Chrome Prospects Superfractor, which isn't autographed, surfaced just a month prior to Strasburg's MLB Debut and drew record attention to the hobby. Read about it here. Had this redemption card been pulled during or even shortly after the prime of the hype, it still would have drawn a lot of hobby attention. It's too bad it remained un-pulled until 2017, four years after its expiration, which itself was three years after the hobby hype.